I can see some of the shine showing through on the photos so can imagine how wonderful it must be for real. Beautiful card Maxine... and hang in there... things will get better! Lovely soft background colours and the silver really pops, many thanks for sharing with us at Penny Black and More challenge. Love card Maxine and such a cool background! Beautiful background and such a pretty, pretty card! I'm thinking of you. Hang in there! Lovely soft colours and very pretty card. Maxine, this anniversary card is stunning! This card is so beautiful I am glad that you have joined us on CCM. You are a blessing. Hugs. What a great card! 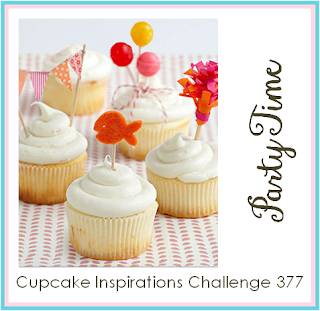 Thanks so much for linking it up to this week's Cupcake Inspirations Challenge!! It is very pretty and perfect for an anniversary card. As for life, it can mellow out now, I give it permission to. Good balanced design and such beautiful soft background! Hope you can give that curved ball a real swing out of your live! A gorgeous card Maxine! and I hope all is well with you and your family! What a lovely card! So glad you were inspired to join us at Cupcake Inspirations! What a great design this week. I am loving how you showed our theme of ‘party time’. Thank you for joining us at Cupcake Inspirations. Good luck with life's curve ball, and praying you are able to make a home run out of it. The silver embossing is really pretty! Thank you so much for joining us at Cupcake Inspirations! Thank you for joining us at Polkadoodles! Great card - love the background you created.